Late in the 1600s, population growth pressed England's colonies to expand, and overhunting led New France to claim more territory for the fur trade. By contrast, New Mexico experienced little internal pressure to expand. Yet all three European powers promoted strategic expansion to counter their rivals' new alliances and territorial gains. England developed well-populated colonies all along the eastern seaboard. These were not extensions of Virginia, but separate ventures, some originating in religious fervor, others in commercial ambition. Religious diversity among England's colonies helped to promote robust immigration. Some French Protestants, or Huguenots, settled in British North America rather than Catholic New France. 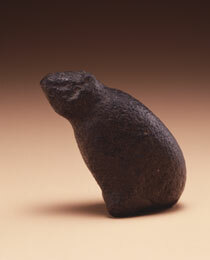 This basalt sculpture of a bear comes from Pawtucket, on Cape Cod Bay, one of a dozen settlements in the Wampanoag confederation. Samuel de Champlain visited the area but decided not to build a French outpost because it was heavily populated. An epidemic in 1616–1617 reduced the Native population, and the English Pilgrims settled there a few years later. In the 100 years it took the English to move 100 miles inland from Jamestown, the French expanded their claims from Québec to the Gulf of Mexico. As overhunting took its toll, the French pushed from the narrow, cultivated St. Lawrence Valley into the vast Upcountry. There they established an empire of negotiation and trade with Native peoples, relying on scattered outposts rather than extensive French settlements. In 1699, French settlers established Louisiana at the mouth of the Mississippi to forestall the other imperial powers from controlling the area. For most of the 1600s, New Mexico consisted of Santa Fe and the pueblos and missions of the Rio Arriba region. El Paso del Norte was the second chartered town. Only when French explorers arrived along the Gulf of Mexico did Spain organize the province of Texas. Priests from Mexico traveled into Arizona and Texas to establish new settlements and missions as buffers to protect Spanish territories from the French. By 1700, New Mexico was no longer alone on the New Spain's northern frontier. This hide painting shows the last stand of the Pedro de Villasur expedition in 1720. Villasur led a party of Spaniards and Pueblos against French-armed Plains peoples. Twelve Pueblos and thirty-two Spaniards died in a surprise attack in Nebraska.